I think almost every food blog has had their Brussels sprout recipe for this winter. Most probably, everyone is already totally overdosed on them. Never mind, here comes my Brussels sprouts recipe. 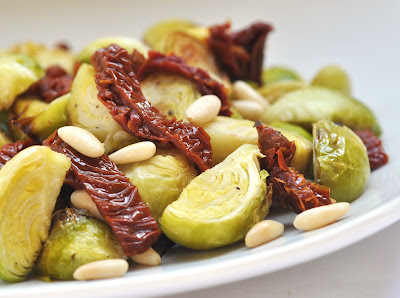 It's a combination of ingredients that I haven't seen on food blogger planet, so hopefully I can get you to try it: Brussels sprouts with sun-dried tomatoes and pine nuts. In my opinion, the dried tomatoes are a good vegetarian substitute for the very popular bacon in Brussels sprouts dishes. We love to have them with pan-fried golden brown Gnocchi in garlic sage butter. I once tried to make Gnocchi myself. That wasn't a real success, in fact, they turned back into mashed potatoes when tried to fry them in butter. If you have a really good recipe for homemade Gnocchis that survive first cooking and then frying, please pass this on to me, will you? Until then, I'll be stuck with the fresh supermarket ones. Put the Brussels sprouts in a bowl. Splash the olive oil over the sprouts and season with salt and pepper. Stir so the olive oil coats the vegetables evenly. Spread the Brussels sprouts on a baking sheet and roast in the oven for about 20-25 minutes. Turn them over once for even roasting. In the meantime, roast the pine nuts in a dry pan over medium heat for 5-7 minutes. When the Brussels sprouts are ready, transfer them to a serving dish, combine with the sliced dried tomatoes and sprinkle the pine nuts on top. Cook the Gnocchis according to instructions. Drain. Heat the butter in a pan over medium heat. Add the garlic and sage and cook for 2-3 minutes. Add the Gnocchis and cook until golden brown. Add the Brussels sprouts and stir. Transfer to serving bowl and serve immediately.